Hello everyone! I thought I would just do a little doodle of my favourites this month. Generally speaking, January has been cold, wet, and dreary and so I've been turning to a few well-loved pick-me-ups to get me through. Somehow this month I managed to get a lot of shifts where I finish early on a Sunday night which has meant one thing-- home in time for War and Peace on the BBC, hoorah! I had never read the book before or really had any concept of what it was about, but I've been loving it every week and will be sad to see it gone. That being said, Poldark should be back soon, and so I'm sure that will help fill the void. When I start posting about wanting to go on a Cornish retreat, you'll know I'm ok again. Another thing that's been cheering up the miserable January nights is, of course, Lush. I managed to grab a huge Rose Jam shower gel in the sale and it's been bringing me immeasurable joy. The original Rose Jam bubbleroon has been my favourite Lush treat of recent times, purely down to it's intense pink bubbly girlishness. However, being the busy bee that I am I don't always have time for a languorous bath of an evening, and so a Rose Jam scented shower gel has been keeping me going in the mean time. Another recent favourite is the Lush Unicorn Horn bubble bar from the Valentine's collection, for the same aforementioned reason that it is just too girly and fab not to love. Then, when I jump out of my bath and into my PJs, the scene has been set by my glorious Yankee Candle in Winter Glow that I got for Xmas. It just has a sort of powdery, clean and cool scent that reminds me of a brisk walk. It lights up the room and just looks great, to be honest. I also got some pom pom high heels from Public Desire in the sale, which equally serve nearly no purpose but just look nice. This also applies to the daffodils I bought for £1 from Tesco, which looked lovely but did die in about two days. 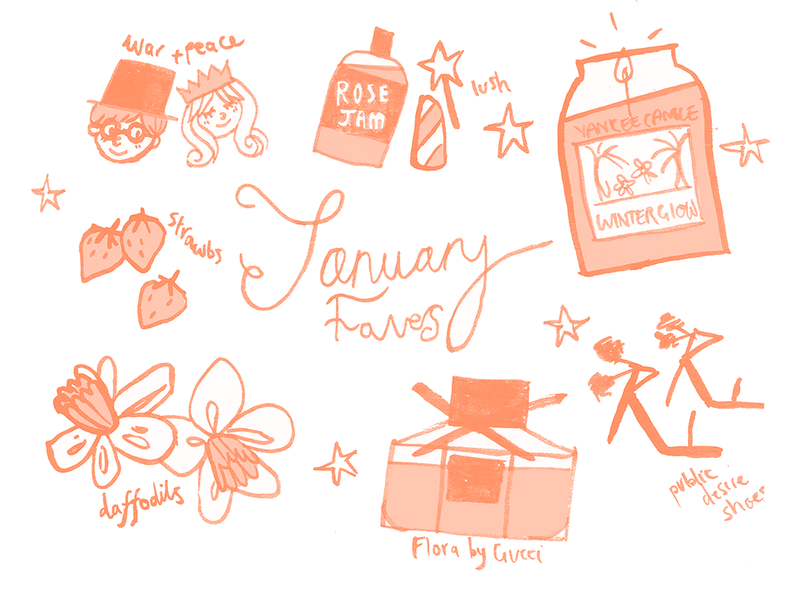 The strawberries and perfume go without explanation really-- I've been really into fruit this month and have also been enjoying spritzing my old favourite perfume, Gucci Flora, when I get ready in the morning. Little joys.